So this year for Lord of the Rings Online Yule fest I have found a definite dearth of holiday spirit. No fault of Turbine’s but I have been feeling meh about it all. This year Turbine added a new zone for the holidays called “Winter Home”, this is a snow covered area (ostensibly located to the NW of Forochel) which holds quite a few festive (and some not so festive) quests for the season. You don’t get direct awards of Yule Fest Tokens, instead you get Frostbluff Coin items that can either be bartered for festival tokens, or used in quests. One of the best parts of the entire zone is the Frostbluff Theater – where a creative hobbit by the name of Bill Shakeshobbit (not 100% on the name) has written an ode to Bilbo and the Great Party. The novel part of the whole thing is that players in the audience get chosen at random (yes, random – listen not to any myths/rumors/”my brothers fathers sisters uncles sons best friends roomates nieces grandfathers nephews roomate from college” says so facts), the play is nifty and it showcases a new system that I hope can be used in the future. There are also some quests that border on being Dickensian dealing with: A rich, corrupt, mayor; a group of homeless destitute folks; and a moral decision on who to help.. I wasn’t much into this one as the “good” path required you to spend your Frostbluff Coins and the “bad” side just rewarded you. 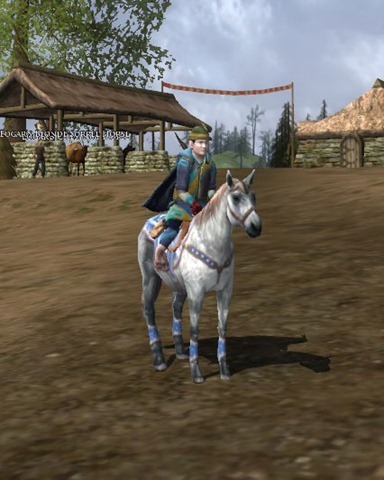 I found the tokens coming in at a much much slower pace than the last festival and decided that the only thing I would focus on is getting 20 tokens for the festival steed.. yah, 20 tokens – they raised the token cost [on top of putting one of the winter fest steeds in the LotRO store] but lowered the purchase price to be on par with world prices (500s first horse, 200s any further horses). That is about all I have done dealing with the festival, might give it another go but I think I will just return to questing instead. That is all for now. Happy Yule Fest in game and Happy Holiday’s outside of game. ~ by Branadoc on December 21, 2010.